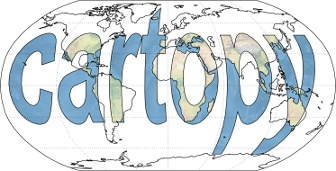 This example further demonstrates WMTS support within cartopy. Optional keyword arguments can be supplied to the OGC WMTS ‘gettile’ method. This allows for the specification of the ‘time’ dimension for a WMTS layer which supports it. The example shows satellite imagery retrieved from NASA’s Global Imagery Browse Services for 5th Feb 2016. A true color MODIS image is shown on the left, with the MODIS false color ‘snow RGB’ shown on the right.